I thought I would share what I've been working on this past week.... NO... WAIT... I have something I need to show you! Take a look at these wonderful, sweet, hen & chicks that now live at my house! Aren't they wonderful? They are made of some type of stone with the old patina. I just fell in love with them. This weekend I'm putting them in a table display in the dining room! Won't they look wonderful in a big basket with greenery... or fall leaves? Kelly, my Enchanted Antiques friend (she's the owner) and I were visiting in her store the other day when I spied them. Yes... I gasped with excitement! There they were.. clucking my name!! 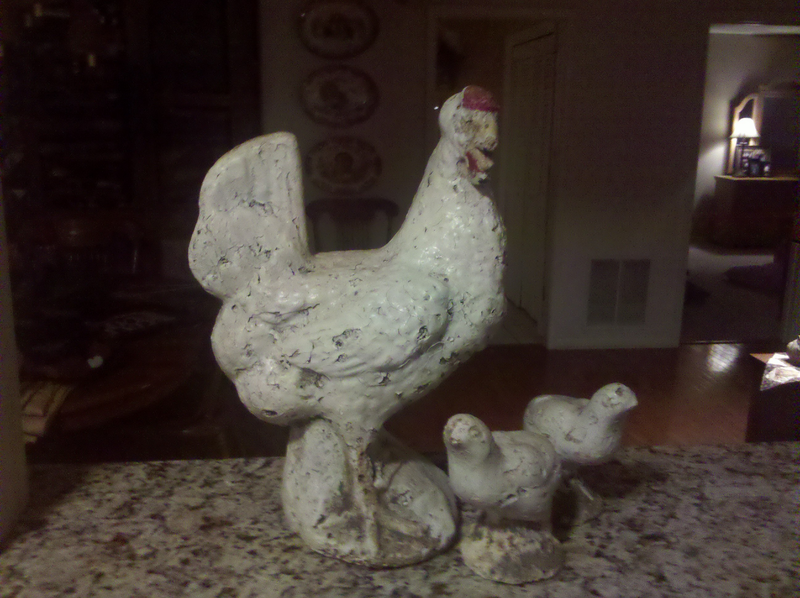 "gloria..cluck.cluck.gloria.cluck.cluck"... HA! Speaking of Kelly - she will have an antique booth in our big quilt show here in Jacksonville this coming weekend! Prime Osborn center - downtown Jacksonville - Thursday - Saturday. You must attend!! It's the biggest one in North Florida/South Georgia (next to the Mancuso Show in Palm Beach). They will have over 400 quilts, over 70 vendors... it's great fun! All 7 quilting guilds in Jacksonville work together to make it happen ... and WOW.. .is it ever a lot of work! Don't miss it! We are so excited!! I spoke with Marcus Brothers (Patty) and asked if we could use some of Bonnie Blues new fabric line - TAVERN BLUES - to make one of our new pattern designs and if they would like to hang it in their booth during market they could! Well, here it is one of the blocks... Tavern Stars is about to be born! Paula Barnes has designed this gorgeous line of fabric for Marcus Brothers. You can see the entire line on their website Marcus Fabrics . I will surely need a minimum of 1 yard each of these prints... they are to die for! These stars are perfect for the beginner (and for those of us that love easy blocks)!! The design is perfect for never missing any points on your star! 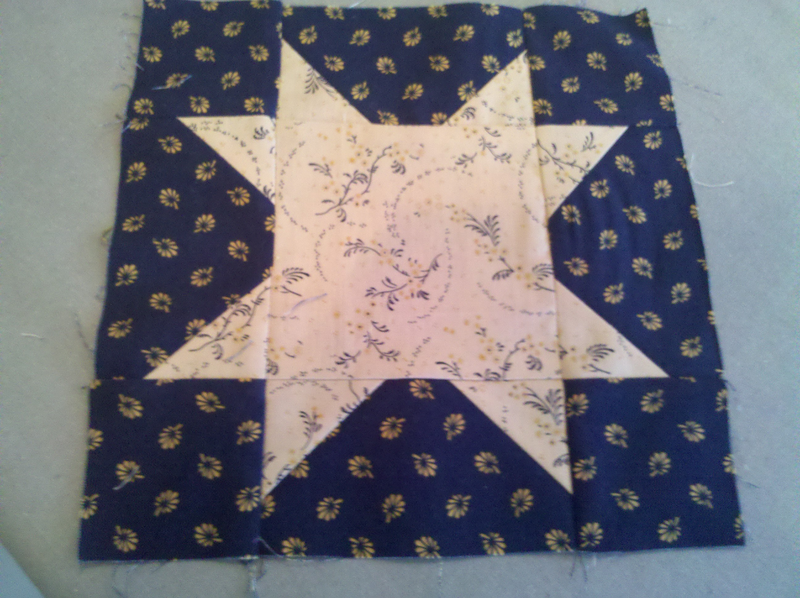 They float in the background.... see how much background fabric is between the star points and the edge of the block? Cool huh? It's a simple design but when you put 90 of these stars together in one big quilt - it's just darn right AWESOME! When we have it pieced and quilted - I'll post a picture for you. You'll be able to order the pattern the first of November. See this great bag? 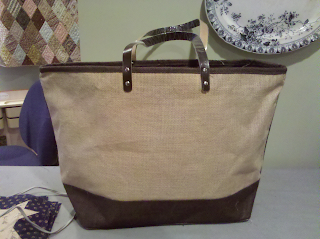 It's made from jute and very sturdy!! I'm designing a wool applique for both sides! It's a surprise for some lucky, lucky people.... announcements will be made in several months! You won't want to miss this one! It's going to be so wonderful and a blast!!! Ok... gotta go.. those Tavern Stars are calling me... have 20 finished - 70 more to go!!! 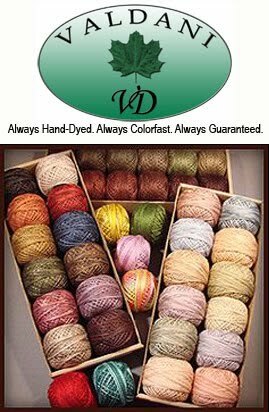 Happy Sewing and remember................... "Celebrate Handmade" !! !